Though I have neglected my blog for some time, I have definitely not forgotten about it (and hopefully neither have you, my dear readers!). Unfortunately, my other reviewing commitments sometimes have to take precedence – unless I want to find myself even more backlogged than I already am. Anyway, for the first update for almost three weeks, here is another 1969 album, and one of the lost gems of the earliest years of progressive rock. As a matter of fact, having been released a few months before In the Court of the Crimson King, Mercator Projected might very well be considered as the first prog album – though, sadly, nowhere as well-known as King Crimson’s iconic debut. Mercator Projected marks the debut of East of Eden, one of the most exciting, authentically progressive acts of those golden years, now unfairly overlooked by most. 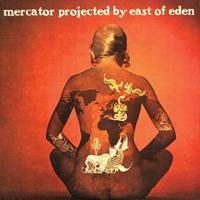 Drenched in exoticism, from its stunning, surprisingly modern cover (depicting a heavily tattooed woman’s back) to its evocative title (a Mercator projection is a cylindrical map projection that distorts the shape and size of large objects), the album is a thoroughly exhilarating listen, blending Eastern sounds with jazz, blues, heavy rock and psychedelia in a heady brew that might at first sound dated, but still holds a deep fascination for the discerning music fan. One of East of Eden’s strengths lies in their use of an impressive array of instruments that, at the time, were not yet common currency in rock music. Dave Arbus’ electric violin (which, incidentally, also graces The Who’s “Baba O’ Riley”) dominates the proceedings, weaving ethereal melodies or bringing a strident note to the compositions, while saxes and flute add their distinctive character to the band’s sound. In the best tradition of the original progressive rock movement, and not unlike the mighty Crims’ seminal debut, the songs on this album are at the same time accessible and experimental, harsh and gently soothing. While the band do not reject their rock and blues roots, they also push the envelope with their richly textured soundscapes, which evoke many different moods. Closing track “In the Stable of the Sphinx”, a jazzy, sprawling instrumental (also present in a longer version in the 2004 remastered edition), is possibly the album’s masterpiece: mainly guitar-driven, unlike most of the other tracks, it features some brilliant sax and violin work. Flutes take centre stage in the dreamy, hippyish “Isadora”; while “Waterways” and “Bathers” conjure images of Eastern-style languor and sensuality, with lashings of sumptuous violin and keyboard melodies. On the other hand, the bluesy, harmonica-driven “Centaur Woman” sounds somewhat grating, and is in my view the weakest offering on the album, even though the slightly distorted, dramatic vocals add some spice to the song. As even a cursory listen will make it clear, Mercator Projected is not the accomplished work of a seasoned band. However, even in its undeniable rawness, it shows the promise than East of Eden would fulfill in their sophomore effort, Snafu. It is a great pity that they did not achieve the fame they would have deserved for their highly individual, creative approach to music-making – they could have become as big as Yes or King Crimson, but now they are forgotten by almost everyone but the real aficionados of the ‘golden era’ of the genre. On any account, Mercator Projected is highly recommended to anyone who likes their prog to be eclectic and challenging, even if a bit rough around the edges. This is an album that every self-respecting prog fan should try at least once.